Florida manatee, Trichechus manatus latirostris, a subspecies of the West Indian manatee, endangered. 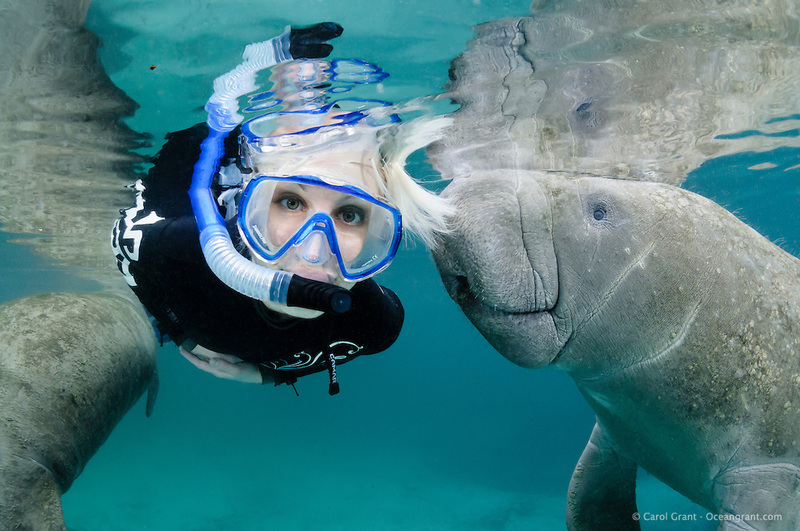 A female snorkeler is observing a manatee who decides to get close and nuzzle her blonde hair. Even when people are practicing polite, no-touch observations, the manatee can often become very curious. Facing forward towards viewer. Horizontal orientation and polite, passive observation. Three Sisters Springs, Crystal River National Wildlife Refuge, Kings Bay, Crystal River, Citrus County, Florida USA.